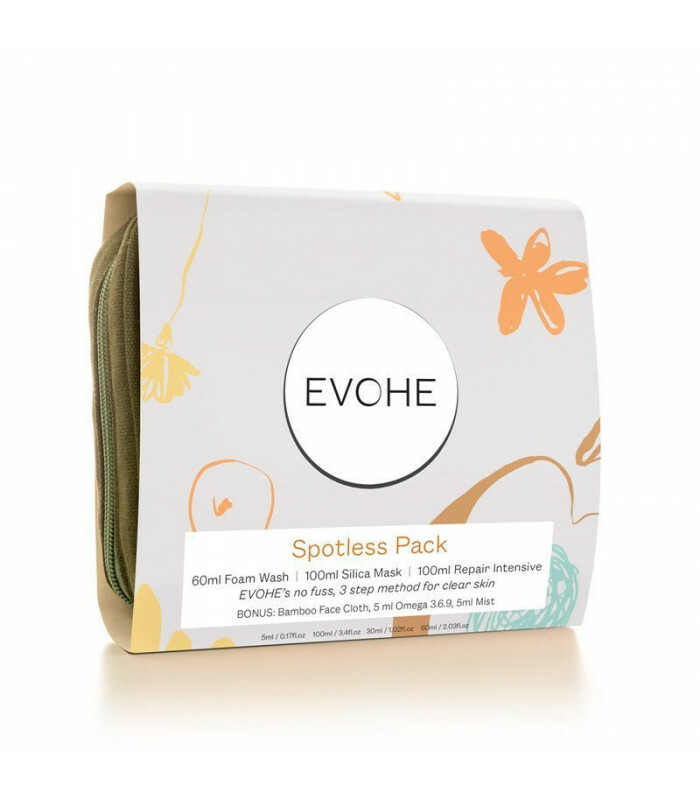 The Spotless Pack is a simple, skin clearing regime infused with active botanicals and antibacterial properties to treat blemishes and promote brighter, clearer skin naturally. Gentle, effective cleanser. Does not strip the natural oils of the skin. Anti-bacterial and anti-inflammatory moisturiser. Soothing relief for inflamed skin. 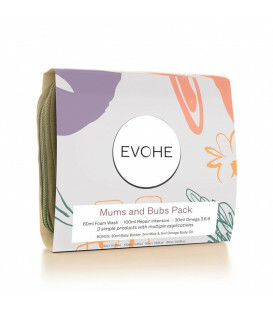 Use with EVOHE Colours mineral powder as a tinted moisturiser with sun protection. – Apply away from water as foam disperses quickly. – Foam Wash is 100% natural and does not contain foaming agents. It’s the pump mechanism that helps this product to foam. – To remove daily residue double cleanse with Foam Wash and use the Bonus Bamboo Face cloth for an extra gentle exfoliation. – Silica mask assists with the hydration of stressed and inflamed skin. It improves the overall complexion by stimulating cell renewal and wound healing associated with acne. – Apply a thin layer of Silica Mask to clean, damp skin. As the product dries, a fine white powder will appear. For a gentle exfoliation, use your fingertips to gently “buff” away the powder by working in small circular motions. You will notice the mask ‘clumps’ in congested areas. Make sure to focus on these areas when lightly buffing the mask off. – Use Silica Mask as an overnight “Spot Treatment”. Simply cleanse as usual and apply a cotton tip size of product directly to pimples. Leave overnight and repeat for a few days. 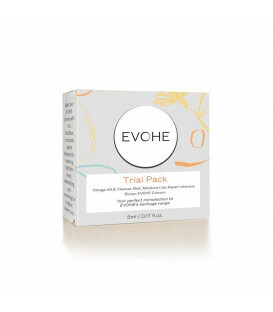 – EVOHE Repair Intensive is non-greasy yet soothing and hydrating. It’s anti-bacterial properties help prevent further breakouts. – Refrigerating this product will provide added soothing relief upon application to inflamed or irritated skin. – Apply to clean skin morning and night as a moisturiser. Can also be mixed with Omega 3.6.9 for extra hydration and skin nourishment. – Can be mixed with EVOHE Colours mineral powder for an anti-bacterial liquid foundation. Allows the skin to breath where conventional makeup can cause further congestion. Assists with the healing of scars. Aids balanced hydration of the skin. Helps even out skin tone. Apply morning or evening alone or combined with Repair Intensive depending on how your skin feels and what it needs. We find in cooler weather or for those in air con/ heating a combination of Repair Intensive and Omega 3.6.9 works wonders. Aids skin hydration and is soothing and calming for acne prone skin. Reduces redness and irritation. Hold approx 20cm from face and with eyes closed pump 2 or 3 times. Can be used anytime throughout the day or as a toner after cleansing. Also assists blending of EVOHE Colours mineral powder. For ingredients see full sized product links above. Patch test before use. Nut oil free. Vegan friendly. Do not ingest. Store below 30ºC. Use within 12 of opening.